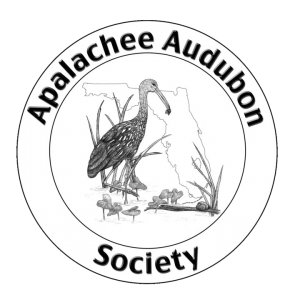 Kathleen is long time member of Audubon and a Past President of Apalachee Audubon. She graduated from Michigan State University with a BS in Zoology, spent 15 years as a freelance writer and currently works at the Florida Department of Environmental Protection. Her high point as a birder came in June 2013 when she attended the field ornithology summer camp at Audubon's Hog Island and added Puffins, Guillemots, Eider Ducks and Arctic Terns to her life list. Kathleen currently serves as the Volunteer Coordinator for AAS and helps with miscellaneous chapter tasks as well. Kathleen and her husband Jim have lived in Tallahassee since 1981 and enjoy birding together whenever they have the time.